You might have heard the term “lifestyle entrepreneur” before, but what does that mean? April Beach is here to explain what lifestyle entrepreneurship is all about! Simply put, it’s making your work, work for your desired lifestyle. To achieve it, you need to make your purpose your business mission, so you can live a truly integrated life! Entrepreneurship is in April’s blood. She has continually pivoted into new businesses based on the changing needs of her lifestyle. She believes purpose is as important as profit when building a business. Currently, she provides coaching to powerful women who want to build profitable, purpose-driven businesses. I was recently on her podcast, the SweetLife Entrepreneur and we had a fantastic conversation about The Niche Tribe Model. How she defines lifestyle entrepreneurship and how its possible for any parent to start their own business. 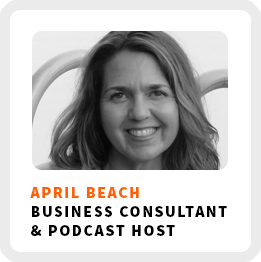 April believes in creating an integrated life rather than negotiating a work/life balance. How she survived living on her own from the age of 13. Why you should ask questions other people may not. Core work activities + habits: 1) Block calendar scheduling. 2) Mastermind with her husband. 3) Involve her kids in her business. Ideal work environment: Working out first thing in the morning to get into her flow. 90-day goal: Launching her new course, Your Signature Offer.